CAN’T imagine how much property cost in the year 1957? Not many would. Octogenarians would have been just past their teens during a time when real estate was not quite as hot a topic as it is now with the twenty-somethings. Details on real estate prices six decades ago are scant. So we have to thank the late Datuk Ravindra Dass for giving us a glimpse of the market place then. Ravindra Dass was the first Malaysian director-general of valuation. He retired in 1990. • Semi-detached houses in the Lake Gardens area were rented for RM250 a month. • Bungalow rentals were about RM150 a month but those in Section 5 fetched double the amount. Put into perspective, in 1957, a good part of the Klang Valley was enveloped in lush plantations and Ravindra Dass had identified these as Kampung Tunku, Taman Tun Dr Ismail (TTDI), Kelana Jaya, Subang Jaya and Section 14 in PJ. Five sen could get you a big bowl of steaming noodles. One sen for an ice-cream potong or a packet of keropok (prawn crackers). Now fast forward to the present. 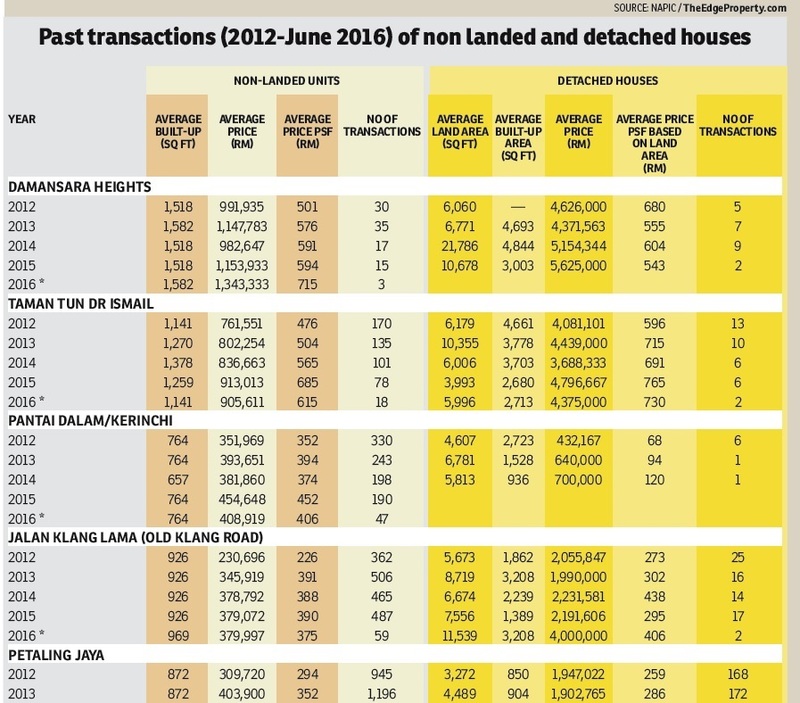 The aging 1-storey terraced houses in KL’s sought-after Bangsar area have long passed the RM1 million price mark. Those in TTDI are lingering at or have crossed over RM1 million, depending on their condition and exact location. Some investors are still hoping that prices in these preferred locations will drop — but they have been disappointed so far. On the commercial land front, in 2014, the Singapore-listed UOL Group Ltd, which owns and operates the Parkroyal and Pan Pacific brands, sold a 171,149 sq ft tract in KL to KSK Land Sdn Bhd for RM3,572 psf — making it one of the highest priced psf deals in recent years. KSK Land is now building the prestigious 8 Conlay project on the site and will be introducing Kempinski Hotel and Residences. Last month, according to The Edge, Berjaya Assets Bhd was looking at selling its freehold land of 41,990 sq ft in Imbi, Kuala Lumpur, for some RM130 million, with the indicative price of between RM3,300 and RM3,500 psf. The land, located next to the integrated Berjaya Times Square commercial development, was acquired some 22 years ago. It is believed to have received approval in principle for the building of serviced suites or serviced apartments. A report in May this year said that the Hong Kong-based Nan Fung Group is believed to be planning the disposal of several parcels of land in Kuala Lumpur and these include two parcels in Jalan Ampang (6.35 acres), one in Ulu Klang near Bukit Antarabangsa (25 acres) and one in Desa Petaling (1.82 acres). Nan Fung was said to be hoping to sell the Jalan Ampang land for as much as RM2,500 psf — this is following the RM2,600 psf benchmark set a year ago by the sale of the 7.98-acre French embassy land, bought by Putrajaya Ventures Sdn Bhd. In April last year, Malaysian Resources Corp Bhd bought the German Embassy land on Jalan Kia Peng in KL for RM3,188 psf or a total of RM259.15 million. Meanwhile, S P Setia Bhd paid RM2,200 psf in 2012 for the 3.07-acre former British High Commission land. 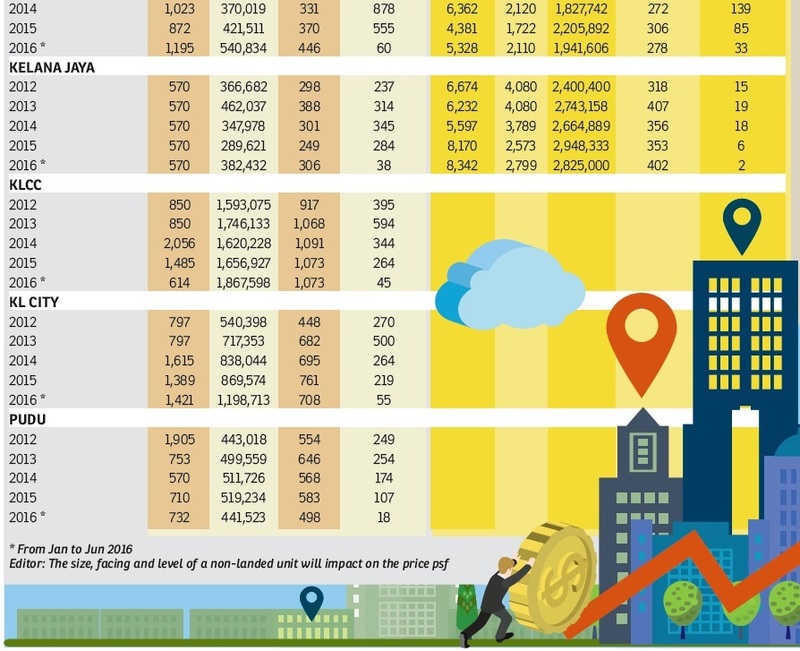 Malaysia has endured several property downturns but data would show that values have always managed to bounce back each time before reaching a new high in the preferred locations. Economic growth, land scarcity in choice locations and enhanced connectivity has everything to do with this. Property has been a significant benefactor of the opening up of highways, as with the LRTs and the MRTs. Though it won’t be another 10 years or so before the Kuala Lumpur-Singapore High Speed Rail takes off, the positive impact of HSR on Malaysia, not just the Malaysian property sector, is clear. Not sure how much you will have to pay a month for your home? Check out our mortgage calculator here. This story first appeared in TheEdgeProperty.com pullout on Aug 26, 2016, which comes with The Edge Financial Daily every Friday. Download TheEdgeProperty.com pullout here for free.